Most airports require passengers to take their shoes off before they go through airport security. However, many people fail to prepare for this until the last second, and this will delay everyone in line. Therefore, you should take your shoes off early and make sure that you are wearing socks so that you do not have to worry about walking barefoot through the airport. It is common for travelers to enjoy a bottle of water or soda while they are waiting in the airport security line, but you need to make sure that you dispose of these items before it is your turn to start putting your items through the x-ray machine. Failure to do so will cause security to issue you a reminder, and this is just one of the many things that will slightly delay the entire process. Everyone needs to show ID and a boarding pass to get through airport security, but many people end up fumbling for these items when it is their turn to present them. Instead of holding up the line and frustrating the passengers who are behind you, you should have all the necessary documents in your hands and open for inspection when it is your turn. Many people forget to take off their jacket or hooded sweatshirt when it is their time to go through security. Unfortunately, this will immediately cause airport security to look at you as more of potential risk, and the odds are high that you will be frisked. You can avoid this problem by simply taking your jacket off and putting it through the scanner. 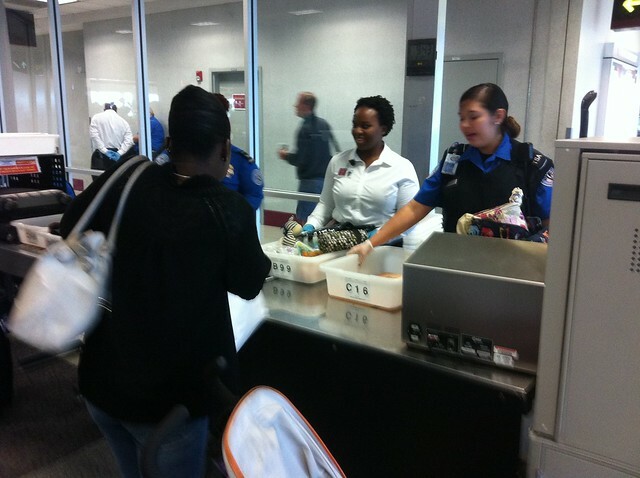 Each airport security member who operates the x-ray screener has been specially trained by experts, such as MSA Security, to look for dangerous items such as explosives. With their extensive training on operating an x-ray machine and image interpretation, they look very closely at everything that is going to be carried onto a plane. In order to make this process go as smoothly as possible, you are required to take certain steps. For example, it is necessary to pull your laptop out of its bag and place it in a separate tub for scanning. Additionally, make sure that you follow all applicable rules so that you do not end up dealing with a problem after your luggage has been scanned. You should not have anything metal such as coins or keys in your pockets when you go through the scanning process. Therefore, you need to make sure that you have removed all of these items from all your pockets before you try to pass through security. Failure to do this will hold up the line and could cause you to be frisked. By simply following these six common sense tips, you can speed up the amount of time that it takes you to get through security. Additionally, all of the travelers behind you will appreciate the fact that you did not cause them to deal with any unnecessary delays. Lisa Coleman shares several tips on how to plan ahead and be prepared for a speedier security check when traveling by air. Highly trained security is imperative to safer travel for everyone. She recently researched MSA Security online at http://www.facebook.com/pages/MSA-Security/208579035832610 and read about their high level of expertise and perimeter security services for a client, such as an airport.